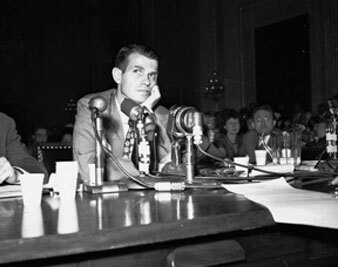 Alger Hiss testifying before the House Un-American Activities Committee in Washington. Whittaker Chambers and Alger Hiss are caught up in what Chambers calls a ‘tragedy of history.’ For Hiss, that’s what it turns out to be. The long-awaited “confrontation” scene before the House Un-American Activities Committee, starring Alger Hiss and Whittaker Chambers, proved one of the most dramatic and at the same time one of the most disheartening sideshows in recent Washington history. Spectators were jam-packed in the huge caucus room, and hundreds were turned away. Photographers with every type of equipment from mini-cameras to television sets roamed tirelessly through the hearings. Radio announcers whispered earnestly into microphones, and copy boys hovered about the crowded press tables to carry out “takes” scratched on notepaper. But, spectacle though it was, the familiar, naive “ballyhoo” of past Congressional investigations—as when the midget sat on J. P. Morgan’s lap—was lacking. There was something ugly in its place. The old carnival spirit had given way to an atmosphere that seemed somehow European, reminiscent of newsreels of people’s courts and party congresses. Nor were the charges the old familiar accusations of stock-market manipulation and fraudulent government contracts. Instead, the air was heavy with the ominous and ultimate charges of modern history: treason, espionage, and insanity. At the end of the day, none of the charges had been proved or disproved. The committee’s relentless questioning of Hiss as to actual dates and details of such matters—as apartment leases and the disposal of an old Ford elicited answers characterized by such persistent qualifications and evasions that an objective observer might have concluded that Hiss’s claim of innocence had been compromised. Yet the truth is that there were no objective people on the committee’s dais; they constituted a court of prosecution as well as of investigation, and their dogged attempts to incriminate the witness might well have moved him to answer with the caution he showed: for Hiss, too, is a lawyer, perhaps more skillful than any on the committee’s staff. After nine hours of their testimony, the truth of the phrase “a tragedy of history” was apparent; and both men had been caught up in it, whichever one was lying. If it is true, as Hiss maintained with unshakable insistence, that he is not and has never been a Communist, that he knew Chambers only as a sponging freelance writer for a short time in the thirties, that his own name and career have been blackened by the wanton charges of a man whose sanity he questions, and that he is being further ruined through the efforts of Republican committeemen like Representative Mundt to discredit such Rooseveltian diplomacy as the Yalta agreement, the China policy, and the United Nations Charter (all of which Hiss helped to author), then he has surely been subjected to a bitterly unfair ordeal. But if, on the other hand, Hiss was a dues-paying underground Communist, as Chambers states—indeed, a “romantic” Communist of such fervent dedication that he insisted on making an imprudent gift of an automobile “to be used by some poor Communist out west”—then his career is one of great irony as well as tragedy, for he has risen high by his own merits in “bourgeois” life. During his fifteen years of government work, he acquitted himself to the satisfaction of Presidents, Secretaries of State, and Senators. And as a reward, no less a personage than John Foster Dulles procured his election to the $20,000-a-year presidency of the Carnegie Endowment for International Peace, one of the most notably slow-moving and ponderous organizations in all the field of middle-class philanthropy. To cap the irony, he succeeded in this position that monument of American conservatism, Nicholas Murray Butler. Chambers’s tragedy is the tragedy of all apostates, and of all whose inner hunger for life, for fraternalism, for a sense of belonging, leads to the acceptance of political or religious absolutes in an age of tragic relativism and the swift obsolescence of all absolutes. His is the tragedy—increasingly familiar in American life—of the middle-class intellect that turns in rage upon all the values of its former habitat; and then, at last, devastated by a sense of disillusionment and loneliness in its adopted framework, returns abjectly to a defense and a worship—even more emotional than the original act of rejection—of the status quo. Since there are so many more in this country who today find themselves caught in some phase or other of Chambers’s cycle than in any such Graustarkian dilemma as that involving Hiss, the plight of Chambers is perhaps the more significant. Some hard-bitten Communist from the Greek mountains would very likely find it difficult to look upon this conflict between an executive of a conservative foundation and a $25,000-a-year journalist as having any real bearing on the course of the Communist Party or of world revolution. But in the American framework, prospering ex-Communists like Chambers are far from unusual. He is more or less typical, in fact, of a growing group of able journalists who have broken with the Communist Party or with left-wing political theories in general. The fact is that native radical movements, like the revolutionary movements of Czarist Russia, have drawn a disproportionately large number of their intellectuals from middle-class backgrounds—and it is in these terms that Chambers explained to the committee the cause of his own adherence and final break with the party. Chambers said he broke with the party in 1937, and “determined to come up above ground and reestablish an identity.” He said he tried unsuccessfully to persuade Hiss to break also: “I am very fond of Mr. Hiss. He was perhaps my closest friend—certainly the closest friend I ever had in the Communist Party.” He told the committee that he got a job on Time in 1939, through the influence of a friend, Robert Cantwell. He is now a “convinced”— that is, a converted—Quaker. His writing in Time and Life has shown an intense preoccupation with theology, and principally with the question of the existence of a primordial, satanic evil in the universe. The mark of his writing and thought upon the magazines—his interest in the thinking of men like Arnold Toynbee and Reinhold Niebuhr, the religious content in cover stories like the one he did on Marian Anderson—have enabled devotees to spot his authorship. Though he eschewed sensationalism, as he told the committee, Chambers painted brief word pictures of his years as a “faceless man” in the Communist underground, pictures that bring to mind, above all else, the tortured world of the subterranean revolutionaries of nineteenth-century Russian novels, especially those of Dostoyevsky. With detailed accusations, he attempted to involve the dapper career man, Hiss, in this background. The impact of the hearings as a whole is not symbolic so much as symptomatic—symptomatic of the onrushing tendency of Congressional agencies to deal in scapegoat-hunting and exposes on sensational but essentially inconsequential levels. Meanwhile, the whole vast machinery of the national economy grinds up the remaining purchasing power and rolls toward the smash-up that anybody with even a grade-school knowledge of arithmetic can see before us.